Home » Blog » It’s A Bird. It’s A Plane. No It’s A Drone. Unmanned Autonomous Vehicles (UAVs) or Remotely Piloted Aerial Systems (RPAS), commonly known and referred to as drones, are aircraft which can be operated without an onboard pilot. Originally developed for military use in situations deemed too dangerous for manned aircraft, their use has since expanded to scientific, recreational, agricultural, commercial, and insurance industries. In the insurance industry, they are highly versatile. They can perform such tasks as property surveillance, 3-D mapping, and roof inspections. As the number of drones increase and their capabilities expand, it is inevitable that they will soon become common sights in the sky. As with any new technology, drones have their own unique risks and hazards. If you have purchased a drone, or are looking to purchase one for your personal or commercial use, the following tips, guidelines, and general information will help you comply with existing regulations, safely operate, and properly insure your drone. Drones fall under the regulatory authority of the Federal Aviation Administration (FAA), the same agency that ensures safety of civil aviation throughout the nation. 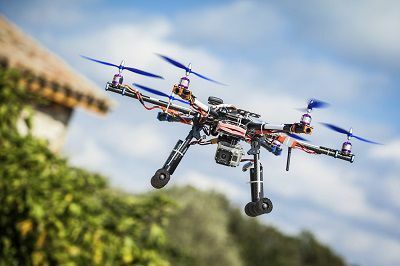 Current regulations include registering drones that weigh more than 0.55 pounds, less than 55 pounds, and avoiding restricted areas such as airports, military bases, and national parks. Failure to comply with such regulations can result in civil penalties of up to $27,500, criminal penalties of up to $250,000, and/or imprisonment for up to three years. With technology ever expanding, the regulations will change on regular basis in order to keep up with new developments, loss experiences, and overall safety concerns. In addition to FAA regulations, there may also be state and municipal codes governing their use. As with any aircraft or machine, it is only as good as the operator behind it. * Be aware of any restricted areas such as airports and military bases. The FAA’s B4UFLY app can show which airports are near you. * Visibility issues such as fog (do not operate if visibility is impaired). * Remember a forecast is just that, a forecast. You should always survey the weather conditions in your flight path. * Fly below 400 feet and remain clear of surrounding obstacles. * Keep the aircraft within a visual line of sight at all times. * Remain clear of and do not interfere with manned aircraft operations. * Do not fly near people or stadiums. * Do not fly an aircraft that weighs more than 55 lbs. * Do not be careless or reckless with your unmanned aircraft – you could be fined for endangering people or other aircraft. * Be respectful of people’s privacy. * Physical Damage for damage to the aircraft itself, along with installed or carried equipment and ground control units. * Property Damage for damage to other people’s property. * Bodily Injury for injury sustained to third parties because of drone operations. * Personal Injury for invasion of privacy as most drones have attached cameras. Personal Injury provides coverage for invasion of privacy, unless the act is intentional. * Commercial Coverage for commercial use (you are being paid for your drone services). The standard homeowner policy excludes business use. * Coverage limits should be high enough to cover the replacement cost of the drone and satisfy potential damage awards. It is important to note that every person’s situation is different. It is best to contact your independent agent to address your coverage needs. Drones will have a profound effect on the commercial landscape going forward. Following regulations, ensuring your drone, and operating it safely will ensure aid to risk management. Have fun flying!